Broadview Developments Inc., a Victoria based developer, has applied to the City of Nanaimo for an amendment to the Official Community Plan (OCP) to remove the properties of 5300, 5280, and 5260 Tanya Drive, in the Lost Lake neighbourhood, from the Urban Reserve classification (AR2) to Neighbourhood. This is the first step that, if successful, would open the door for a future rezoning and subdivision development application (see map). These three properties cover 72 acres of wilderness that border the northern boundary of Linley Valley Cottle Lake Park. This OCP amendment application is a revision to the original request submitted to the City of Nanaimo in November 2016 that also included an application for rezoning. It is not clear why the Developer has removed the application for rezoning at this time. However, we do understand that the requirements for detailed assessments and plans are less onerous for an OCP amendment. The letter of rationale, submitted by the Developer as part of the application process, proposes a steep slope subdivision with 469 living units. The conceptual site plan (see left photo panel) submitted illustrates a housing mixture of 91 single and 67 multi-family dwellings. No rationale is given for the discrepancy in the total number of dwellings in the plan versus the number of living units mentioned in the letter of rationale. It is possible that the 469 count includes estimated secondary suites. It is worth noting on this concept plan, that roads run through the protected green corridor and two of the major wetlands. Clearly, while there appears to be some attention paid to preserving sensitive habitat, it seems that roads may supersede this objective. If you enjoy the beautiful trails along the major water course from the beaver pond to Cottle Lake in the existing Park, imagine looking at the fences and backsides of the 15 homes that are as close as 150 meters to the trail, and seeing other homes perched all the way up Linley's Hidden Ridge. Linley Valley has a rich diversity of habitats and physical features. 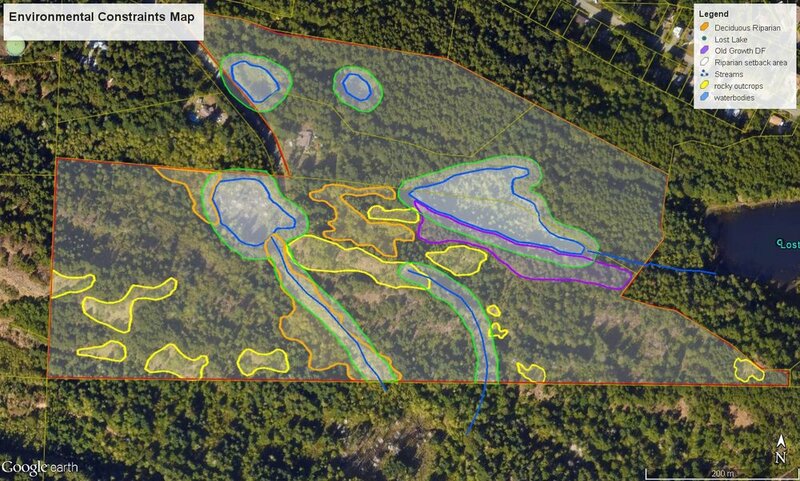 In the Environmental Constraints Map, submitted as part of the revised application (left), key features have been highlighted including old growth Douglas Fir forest, four waterbodies, three streams and some of the Valley's prime rocky outcrops. This diversity creates a variety of habitats and physical features supporting a range of plant and wildlife species. Also included in the application is the Developer's Detailed Biophysical Assessment Report. Save Linley's Hidden Ridge team is currently reviewing this report. Preliminary findings already indicate significant deficiencies. Lost Lake Road lacks sidewalks or shoulders for safe pedestrian and bicycle access. The proposed development would obviously result in increased traffic on Lost Lake Road and the major connectors including Laguna Way, Rutherford Road and Hammond Bay Road. This is one of several significant neighbourhood issues that residents have raised should this development proceed. The Developer has submitted a Traffic Impact Assessment which is not available to the public on the City website. The City has requested offsite improvements to which the Developer provided a letter in response. This letter is available on the City website. Whereas the Save Linley's Hidden Valley team have heard over and over that residents are concerned with the estimated traffic increases and the impact these would have on the neighbourhood, the Developer has stated in their response letter that residents are only concerned with traffic speed. As a result, the Developer is dismissing the increased safety concerns regarding pedestrian and bike access along Lost Lake Road. Save Linley's Hidden Ridge team is currently reviewing this letter and trying to get public access to the Traffic Impact Assessment. Clearly cost, not public safety, has been the decisive factor in addressing the City's requested offsite improvements. Additional documents pertaining to the development application can be found on the City of Nanaimo "What's Building" website.